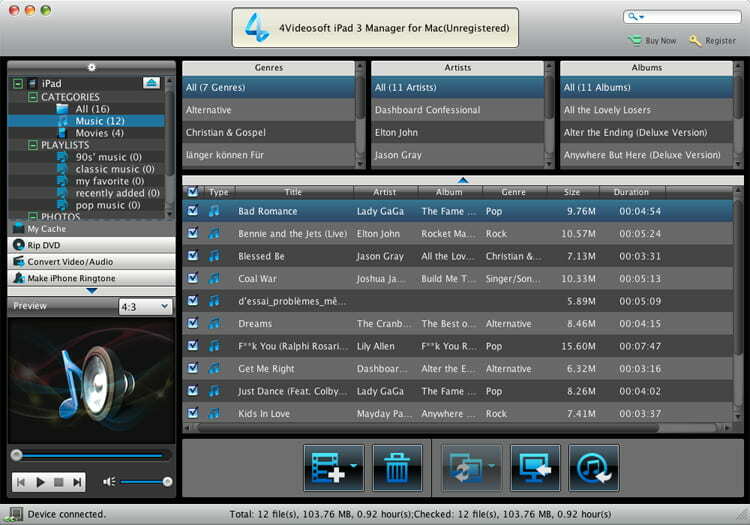 4Videosoft iPad 3 Manager for Mac is a professional Mac iPad 3 transferring software, which can transfer all iPad 3 files to Mac and Mac to iPad 3 such as music, movie, photos, camera roll, camera shot, ringtone, etc. iOS 6 and iPhone 5 and adds the function of digital signature, iMessage and contacts. Aneesoft iPhone Video Converter is an easy-to-use and totally iPhone video converter that can convert all popular video formats to iPhone and iPhone 3G video/audio formats. Daniusoft DVD to iPod Converter for Mac takes care of your needs. This Mac DVD to iPod Converter gives you amazing conversion experience with excellent output quality and super conversion speed. Tutu MOV to X Converter is a fast and excellent tool of converting MOV file to most popular video formats, such as MOV to MPEG, MOV to AVI, MOV to MOV, MOV to MP4 and MOV to WMV etc. And also you can convert MOV to your portable devices. 4Easysoft Mac Walkman Video Converter is a powerful and useful Walkman Video Converter for Mac designed to convert both standard and high definition video formats to Walkman MP4, MP4 AVC (.mp4) and convert audio to MP3, WMA, M4A, etc.